Your very first home, is the best investment you will ever make. This amazing value First Home Buyer Package, has everything for the young family. 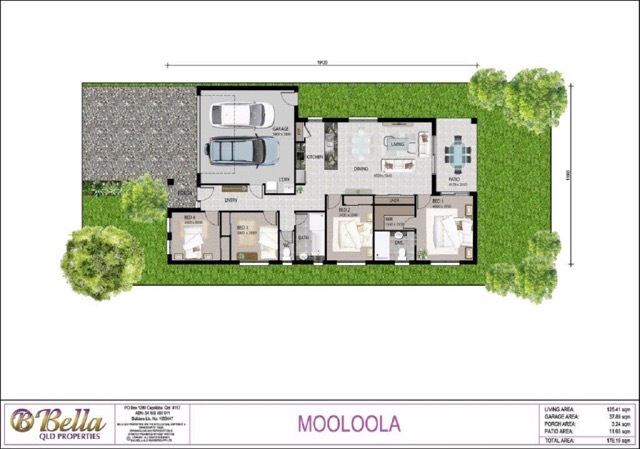 This Turnkey Package of the Mooloola by Bella Qld Properties at Mirvacâ€™s Everleigh Estate at Greenbank, is the perfect start for the first home buyer. An ideal design offering 4 bedrooms, 2 bathrooms, 2 car garage, spacious open living area and a large outdoor area, which is perfect for that Sunday barbeque. Everleigh Estate is the Premier New Mirvac development which will deliver a vibrant new community offering all the advantages and convenience of a connected modern lifestyle. You’ll enjoy a variety of supermarkets, shopping, childcare and schools â€“ within easy reach. The town centre of Greenbank, bringing shops, cafes and restaurants even closer to your doorstep. Closer to home, get back to nature and explore 25 hectares of regional sports and recreation parklands and 15 km of walking and bike trails planned within the community, giving you the best of both worlds. With a further 60 hectares set aside for conservation parkland.